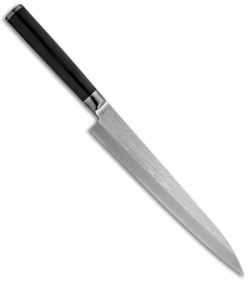 The Shun Classic Pro 9-1/2" Yanagiba has a long, thin, "willowy" blade with the traditional Japanese single-bevel edge and hollow-ground back. It is designed to be pulled through the food, reducing loss of the natural juices and creating the cleanest cuts imaginable. The yanagiba is most often used for preparing sashimi, or sliced raw fish, and is excellent for slicing meats and other moist foods as well. The Shun Classic Pro Yanagiba is part of the Shun Classic Pro line of traditional Japanese blade shapes. 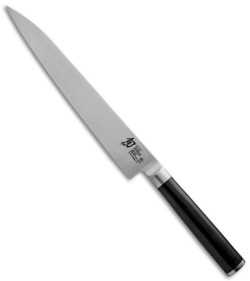 Because nothing compares to the scalpel-like precision of a single-bevel, the Shun Classic Pro line features single-bevel blades in pure VG10 stainless steel with sharp chisel edges and comfortable D-shaped PakkaWood handles. With their dramatic, graffiti-etched blades, these knives are visually striking as well. The etched design on the blade—different for each blade style—is similar to etching found on custom Japanese knives and used to identify the blade’s maker. Blade backs are gently hollow ground, creating a tiny air pocket between blade and food so the knife glides through each task with quick precision. Sharpening on a whetstone is practically effortless.